Delegates will begin the week in the classroom with our genealogists, learning how to get to grips with research techniques, archives and genealogical sources in Ireland; providing you with the information and skills to further explore your family history during the course and after. Following the classroom portion of the programme delegates will have a choice of assisted research in the archives with our team of experienced genealogists or excursions to a place of historic interest, including Bru na Boinne, Derry/Londonderry, Barons Court, Kilmainham Gaol and the Giant's Causeway. Delegates will spend this first morning being introduced to Irish Family History Research. Understanding the importance of our land divisions and sense of place to local people in rural Ireland (irrespective of location) are crucial to success in Irish genealogy. This presentation explores the different administrative divisions: e.g. townland, barony, parish, County, Poor Law Union, etc, their origins, how they relate to each other, and their relevance and usage in the historical records. This session will focus on how much information can be gleaned from the 1901 and 1911 census returns and the value of these resources, even for those whose ancestors had left Ireland prior to the twentieth century. We will also look at the census fragments that survive for the nineteenth century. Civil registration of all births, deaths and marriages began in Ireland in 1864 (non-Catholic marriages registered from 1845). This session will focus on birth, marriage and death records, the information they contain and the various websites that can now be used to access them. This afternoon will see delegates register and receive their PRONI Reader’s ticket, followed by a short orientation tour and then the research will begin. The Foundation’s research team will be there to help you get started with your research until the archive closes. The day will finish with a group meal at one of Belfast's many popular restaurants. This session will look at the records available for main religious denominations in Ireland and how their varied histories have affected the types of records which exist. We will examine baptismal, marriage and burial registers and will focus on where these records are held and how to access them. Wills can be an invaluable source for clarifying family connections and learning more about our ancestors. During this session we will look at the background to the administration of wills in Ireland, assess the information that can be obtained from a will and where these records are held and how they can be accessed, both in the archives, and more recently, the large amount of material which has been made available online. The records of the National Education system, introduced in 1831, can be a most useful collection of records for tracing families, especially in the period 1860–1920, and where the records survive back to the 1850s and 40s. As well as providing information on school children the records offer information on teachers, and the establishment of schools and how they were run. They can give details of family movements within Britain and Ireland, and indeed emigration to America, Canada and Australasia. Prior to this period some records also exist for private schools, schools supported by various religious bodies, and schools established to educate the children of the poor. The session will explore the value of these records for family history research. This afternoon will see delegates continue their research in PRONI with our research team before having a free evening to enjoy Belfast city. Land records are an extremely important part of genealogical research in Ireland due to the destruction of the majority of nineteenth-century census records. We will look at Griffith’s Valuation, the first truly comprehensive survey of property in Ireland, which covers the period 1848 to 1864, as well as the subsequent Valuation Revision (or Cancelled) Books. The documents generated by the management of landed estates are among the most valuable of records for the local and family historian.This talk will look at the background to landed estates in Ireland, before going on to discuss the more useful sources found in estate collections. Printed sources are essential for those researching Irish and Scots-Irish ancestors. We will look at a wide range of printed sources including newspapers, street directories and Ordnance Survey Memoirs; as well as identifying how to access this material. This afternoon will see delegates continue their research in PRONI with our research team. Our day will then conclude with an evening meal in Belfast. Day 4 - A choice of assisted research or a Tour of Kilmainham Gaol and the Knowth passage tomb at Bru na Boinne. Delegates who choose to continue to their research at PRONI will be able to do so with our research team. 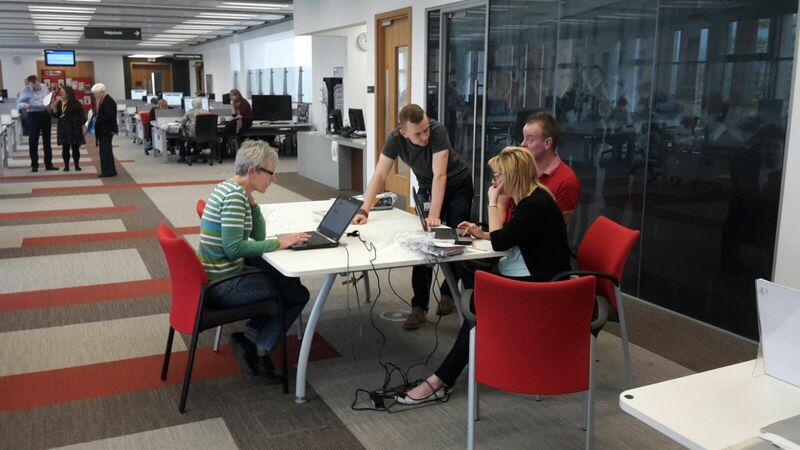 The Foundation’s research team will be there to help with your research until 5pm. Delegates who wish to tour this day rather than research will visit both Kilmainham Gaol in Dublin and the Knowth burial mound in the Boyne Valley. There is also an opportunity for delegates wishing to visit the Registry of Deeds to spend the morning researching in this archive with our researchers. Now operating as a museum delegates will receive a guided tour of Kilmainham Gaol, one of the largest unoccupied gaols in Europe. Leaders of many Irish rebellions were detained in Kilmainham including Robert Emmet and Eamon de Valera. After lunch the group will then depart for the mysteriously beautiful passage tomb at Knowth, a neolithic monument in Ireland which predates the ancient pyramids by 400 years and Stonehenge by 1000! The group will then leave pre-history Ireland and travel through the fabled Cooley peninsula, home to many tales from Irish folklore including the Táin Bó Cúailnge and Cú Chulainn before returning to Belfast. Delegates who choose to continue to their research at PRONI will be able to do so with our research team. The Foundation’s research team will be there to help with your research until 16.30 before our final group dinner in Belfast. One of the finest examples of a walled city in Europe, delegates will walk on Derry's famous walls and explore the amazing sites that the city has to offer which includes visits to First Derry Presbyterian Church and the Siege Museum.Delegates will also have free time to explore the other historic and interesting sites of the city which include the Tower Museum; the historic Guildhall; St Columbs Cathedral and St Augustine's Church. After our visit to the City of Derry we will make the journey into Co. Tyrone and visit the grand home of the Duke of Abercorn, Barons Court. Barons Court is not normally open to the public and for delegates this will be a rare opportunity to see inside this fascinating house. Following our tour of Barons Court we will then return to Belfast for our final group dinner. Day 6 - A Group Tour through the Glens of Antrim culminating in a visit to the Giant's Causeway. 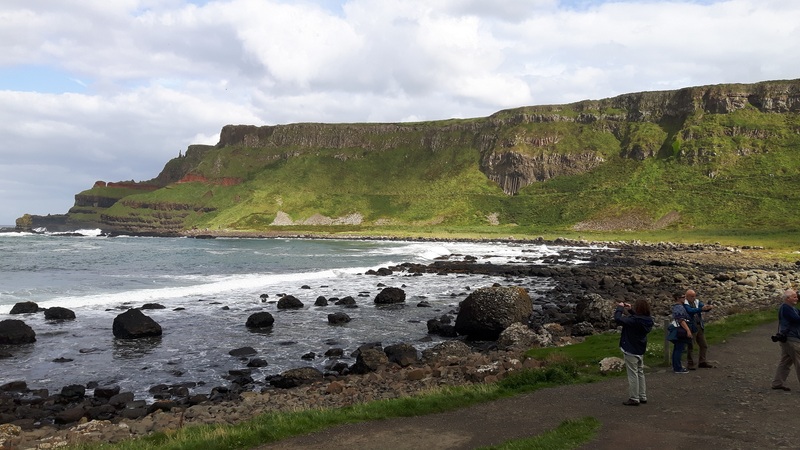 The final day of Introduction to Irish Family History will see all participants travel through the Glens of Antrim, along the Antrim Coast, winding between picturesque villages and unforgettable scenic locations. After lunch delegates will visit the iconic turreted ruins of Dunluce Castle, the inspiration of C.S. Lewis' Cair Paravel from the Chronicles of Narnia and the site of the House of Greyjoy from Game of Thrones. After the tour of Dunluce Castle delegates will then experience the stark beauty of the Giant's Causeway a UNESCO World Heritage Site that was voted the fourth greatest natural wonder in the United Kingdom. More information on what will be covered during the classroom portion of this programme.